Mazda MX-5 RF Interior, Sat Nav, Dashboard | What Car? 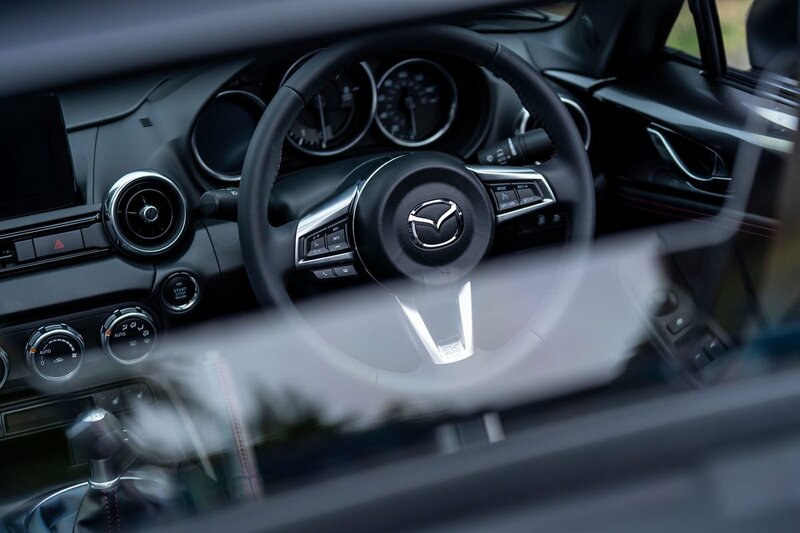 The MX-5’s driving seat is very low-set, with your legs placed straight out in front of you in a go kart-esque stance, which can make getting in and out an inelegant affair. The low-set seat has a standard tilt-adjustable base, which is a welcome addition, but there's no height adjustment. The steering wheel adjusts for reach and rake, although taller drivers might wish it came towards them a little closer. It's also worth mentioning that the pedals are slightly offset to the right. That said, most drivers will be able to get comfortable in the snug seat, as long as they're not too tall, so long journeys won't be a chore. 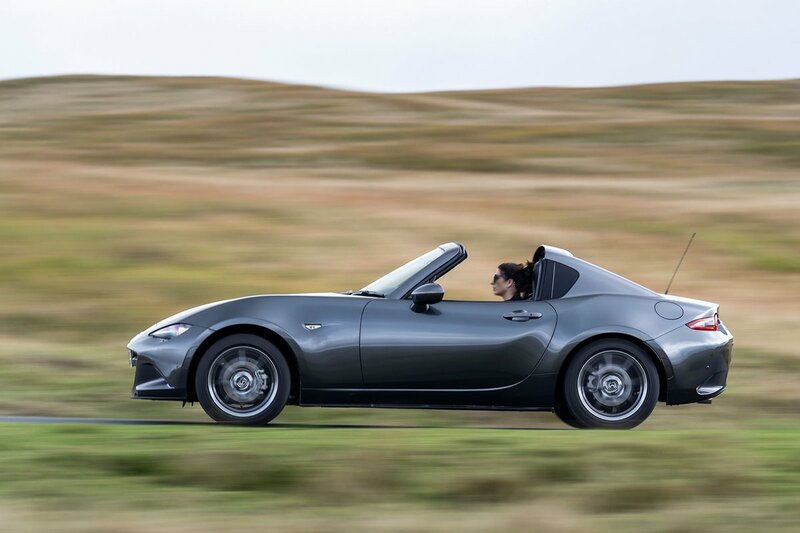 The MX-5's high-set, stubby gearlever is in just the right place, there’s a well-placed padded central armrest, the seat offers plenty of side support in corners and the dashboard layout is sensible and easy to use. Looking down over the MX-5’s sloping bonnet gives you a real sports car feel, and with relatively thin windscreen pillars, it’s actually pretty easy to see out of at junctions and roundabouts. However, the small rear window limits your view straight back and that ‘fastback’ design obscures the view looking over your shoulders, whether the roof is up or down. Rear parking sensors are standard on the top two trims only. A reversing camera is standard on top-spec GT Sport Nav+ models and optional on Sport Nav+. 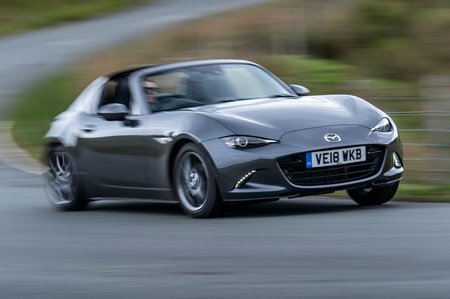 For the MX-5 RF, the entry-level model is the SE-L Nav+ (unlike the regular MX-5, which starts with the more rudimentary SE trim) which comes with a 7.0in infotainment screen that incorporates Apple CarPlay, Android Auto, sat-nav, a DAB radio and Bluetooth. As well as being well-specified, the infotainment system is easily controlled via a rotary dial and shortcut buttons in front of the gearlever. The only irritation is that you can’t turn off voice guidance altogether; you can silence it, but it still quietens the speakers when there would have been a guidance announcement. The Bluetooth connectivity is quite effective and it's relatively easy to hold a hands-free telephone conversation with the roof up on the motorway. You will struggle with the roof down, though. There are two USB ports at the base of the dashboard, next to a cubby, making it an ideal place for storing and charging a mobile phone. Considering the MX-5 is a relatively inexpensive proposition, its interior feels commendably smart. There’s a good array of textures that add to its visual appeal, and although the interior plastics are hard to the touch, they still look good. This quality feel extends to the nicely damped switches and the fact that everything seems well screwed together. If you splash out on a Sport Nav+ or GT Sport Nav+ model, you get plush-looking leather seat trim and smart, contrasting stitching.